Tailwin SphereArtistic Blue Accented Art Glass Sculpture Sphere. 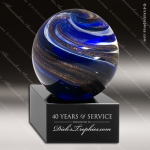 Art glass award globe with blue, white and metallic gold highlights on black glass base. Laser engravable aluminum plate. 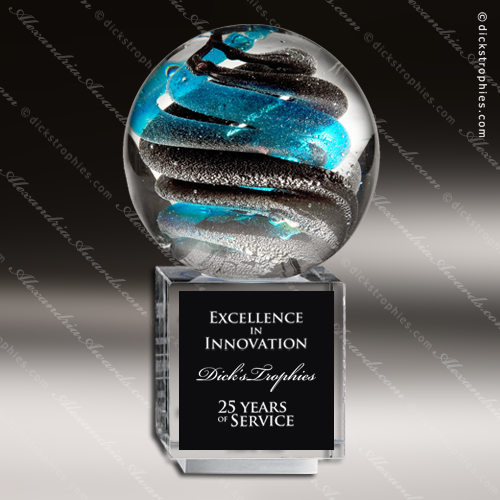 These glass awards are packaged in satin-lined, padded gift boxes. 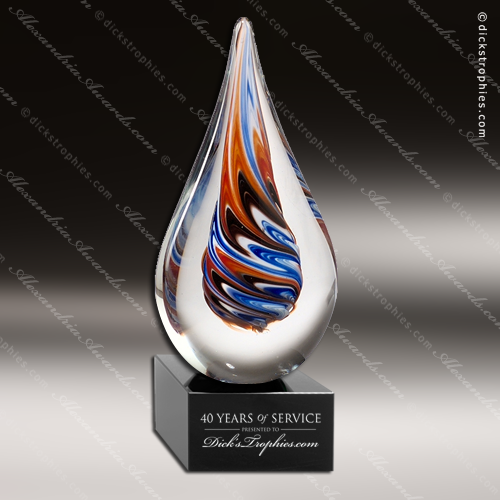 Each piece of art glass is made by hand, air bubbles and color variations are common. Talien Teardop Artistic Multi-Colored Red Accented Art Glass Sculpture Teardop. Teardrop-shaped art glass award on black glass base. Laser engravable aluminum plate. 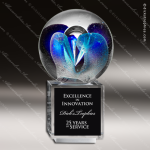 These glass awards are packaged in satin-lined, padded gift boxes. Artistic Glass Cahier Galileo Trophy Award. Our carefully selected art glass represents inspired works of art and a master display of craftsmanship all in one. These magical pieces feature lyrical swirls, rhythmic patterns of suspended air bubbles, and free flowing forms that make for fascinating conversation pieces. 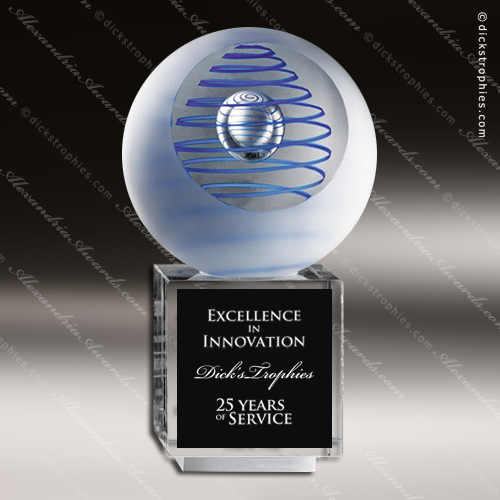 Each one-of-a-kind award is elevated perfectly on its optic crystal base. Please be aware that all pieces of art glass are individually crafted and will vary, as well as have minor imperfections. 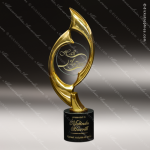 Artistic Glass Cajan Helix Trophy Award. Our carefully selected art glass represents inspired works of art and a master display of craftsmanship all in one. These magical pieces feature lyrical swirls, rhythmic patterns of suspended air bubbles, and free flowing forms that make for fascinating conversation pieces. Each one-of-a-kind award is elevated perfectly on its optic crystal base. Please be aware that all pieces of art glass are individually crafted and will vary and may have minor imperfections. 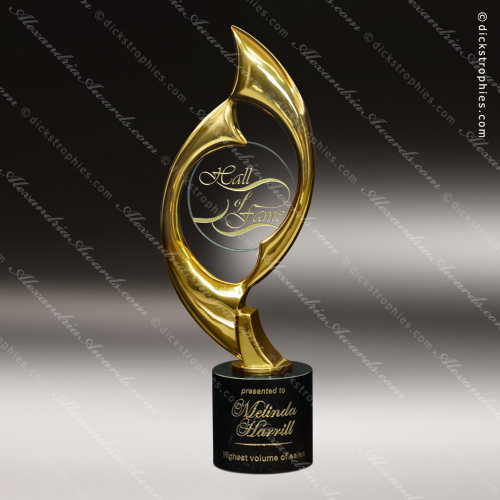 Artistic Glass Calabar Intrigue Trophy Award. Our carefully selected art glass represents inspired works of art and a master display of craftsmanship all in one. These magical pieces feature lyrical swirls, rhythmic patterns of suspended air bubbles, and free flowing forms that make for fascinating conversation pieces. Each one-of-a-kind award is elevated perfectly on its optic crystal base. Please be aware that all pieces of art glass are individually crafted and will vary and may have minor imperfections. Aritistic Cherry Calixtine Premiera Plaque. 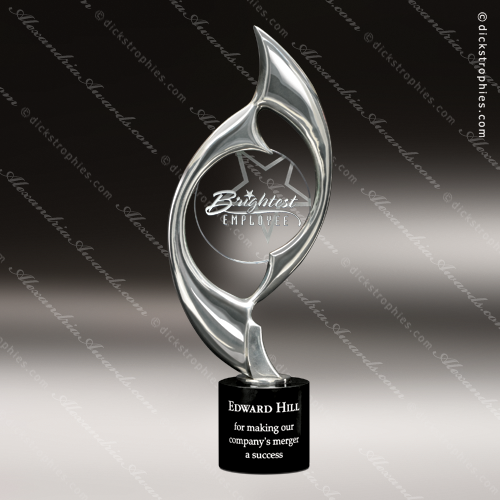 Award plaque or a work of art? We think you'll agree that our Premiera Plaque is a little bit of both. 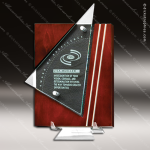 This contemporary designer plaque maintains warmth through the use of cherry stained wood and black leather that is contrasted by the use of chrome plated rods. The jade glass is suspended to add dimension, while its textured patterns add a unique design element that sets off your message. 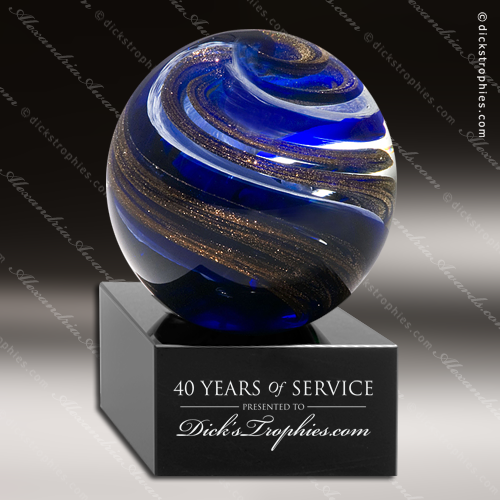 Comes ready to hang or will stand alone using its acrylic stand.